I’m always happy to find a mini version of food, mainly to save on calories. 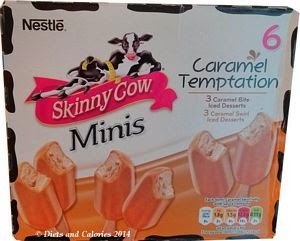 However, I was surprised to find a mini version of these Nestle Skinny Cow Caramel Temptation Iced Lolly sticks as the regular version only have 93 calories each! Still, if you’re after something even smaller, well, these mini iced caramel lollies are really quite cute. They taste just the same as the regular sized ones (see review) and each 60ml lolly has 74 calories. Skinny Cow products seem to come and go. There were the Skinny Cow Triple Choc Iced Brownies and the Skinny Cow Dippers minis which have vanished completely. Probably best not to get too attached! 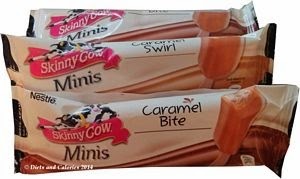 Anyway, these new Skinny Cow Minis are here now and there are two varieties of Caramel Temptation: 3 x Caramel Bite and 3 x Caramel Swirl. Because they’re smaller you get six lollies per box rather than the three with the bigger version. This is handy if there are more than three of you wanting one of these at the same time. There are a squillion ingredients. OK, maybe not that many, but the ingredients list is quite long – not a good health sign. Check out the traffic light below for further nutrition information. So far I have only seen them in Sainsbury’s and haven’t noticed them in the mint flavour. Priced at £3.00 per box at the time of writing. Nutrition Information per Lolly (60ml): 74 calories, 0.9g protein, 13.1g carbs, 12.1g sugars, 2.0g fat, 1.6g saturates, 0.1g fibre, 0.09g salt. Caramel Flavour Iced Dessert (Reconstituted Skimmed Milk Powder, Water, Sugar, Glucose-Fructose Syrup, Glucose Syrup, Coconut Oil, Whey Powder (from Milk), Whey Protein Concentrate (from Milk), Emulsifiers (Mono- and Diglycerides of Fatty Acids, Lactic Acid Esters of Mono- and Diglycerides of Fatty Acids), Stabilisers (Locust Bean Gum, Guar Gum, Xanthan Gum), Colour (Plain Caramel), Flavouring, Salt), Caramel Flavoured Coating (43.5%) (Water, Sugar, Reconstituted Skimmed Milk Powder), Caramel Powder (7%) (Skimmed Milk Powder, Whey Powder (from Milk), Sugar, Butter (from Milk), Caramel (2%) (Sugar, Water, Acidity Regulator (Citric Acid)), Stabilisers (Locust Bean Gum, Guar Gum), Flavouring, Salt), Toffee Pieces (2%) (Sugar, Glucose Syrup, Cocoa Butter, Butter (from Milk), Coconut Oil, Emulsifier (Sunflower Lecithin), Cornflour, Flavouring, Raising Agent (Sodium Bicarbonate), Salt, Colour (Plain Caramel).